Tail Chasing, Leg Licking -- Can't You Stop? This month’s “Helping People Help Their Pets” column features an interview with Melissa Bain, MS, DVM, DACVB, and Marsha Reich, DVM, DACVB, leaders in the field of veterinary behavior and authors of the compulsive disorder chapter “Tail Chasing, Leg Licking – Can’t You Stop?” from “Decoding Your Dog,” a new book by the American College of Veterinary Behaviorists on dog behavior. 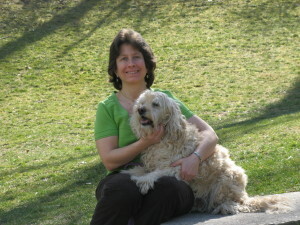 Marsha Reich DVM, DACVB and her Wheaten Terrier mix, Shandy. Can you tell us how you each decided to become veterinary behaviorists? Dr. Bain: I was in both small- and mixed-animal practices and realized how much of veterinary medicine was related to behavior. There was a certified applied animal behaviorist (Dr. Patricia McConnell) who had a radio show, and the more I listened to her, the more I realized that is what I wanted to do for the rest of my life. I haven’t regretted one moment since. Dr. Reich: I spent several years in a small-animal practice and became intrigued with behavior and its impact on my patients. I found that small changes to my approach greatly improved how some difficult patients did with their veterinary visits. I attended any continuing education I could to learn more about behavior and decided to do a residency. I love that I can make such a difference in the lives of pets and people. Tail chasing, leg licking and other behaviors may be a sign that your dog has a compulsive disorder. How does this disorder differ from obsessive compulsive disorders often exhibited by people? These behaviors look very similar to those seen in people. However, the one major difference is that humans can verbally state that they are obsessing about something, which causes anxiety. The anxiety causes them to “compulsively” and repetitively repeat a certain behavior, which relieves this anxiety. It is currently not possible to ask dogs if they are “obsessing” about something. Additionally, for some dogs there may be more of a displacement behavior in response to something that is causing the stress. What are the various causes of repetitive behavior in dogs? When do these repetitive behaviors become compulsive? Things that cause a dog to be stressed, such as separation anxiety, fear of people or noise phobia, can lead to that dog developing a repetitive displacement behavior. A medical condition can also be misinterpreted as a compulsive disorder. If these behaviors continue for an extended period of time, it can become a more ingrained behavior. Your look at repetitive behaviors also delves into underlying medical issues, such as the case with Jasper, a Coonhound. What should pet owners do to find out the root causes of behaviors that are affecting their dogs? If an owner notices that their dog’s behavior is unusual, first and foremost they need to visit their veterinarian. Another diagnostic tool is a video recording of their dog’s behavior, both with and without the owners present. Owners should also keep a journal of their dog’s behavior so that they can document any patterns or triggers to the behavior. As you note in your chapter, medical and behavior issues are often intertwined, requiring advice from several specialists. What advice would you give to pet owners in seeking help from these various specialists? If an owner thinks that their dog has a compulsive or other repetitive behavior, once a primary medical condition is ruled out by their veterinarian, the best person from whom they should seek help is a veterinary behaviorist. They are best suited to evaluate the interaction of medical and behavioral causes, and are most educated on the use of psychotropic medications to treat these problems. Why is it so important to address possible compulsive disorder behavior sooner rather than later? Studies have shown that the longer a compulsive disorder continues the more difficult it is to treat. It also results in prolonged physical or mental discomfort for the dog and often frustration for the owner. As veterinary behaviorists, you recommend desensitizing and counterconditioning as proven ways to treat repetitive behavior. Can you please explain these techniques: how and why they are important in addressing compulsive disorders? Desensitizing is exposing the dog to the situation that would trigger the repetitive behavior but in a very gradual manner so that the behavior isn’t triggered; and at the same time, counterconditioning by rewarding a competing and more appropriate behavior such as sitting. This combination helps to teach the dog a new behavior to replace the repetitive one. What role do medications play in addressing compulsive disorders in dogs? Medications that affect serotonin can help to decrease the intensity of some compulsive disorders so learning new behaviors can begin. No response or limited response to a medication may suggest that there is a medical component to the problem, or that you have to investigate other medications. Why is it important to keep a journal of your dog’s behavior both before and during treating compulsive disorders? Secondly, what are reasonable expectations that pet owners should have when it comes to treating compulsive disorders in their dogs? A journal is useful so patterns or triggers for the behavior can be identified. It is useful to track changes as the treatment plan progresses and can help identify what seems to be working and what isn’t. Treating compulsive disorders takes time, sometimes weeks to months before progress is noted, and it can take several more months to resolve a problem. Help is available if you suspect a compulsive disorder in your dog. Contact your veterinarian to rule out medical disorders, and if the problem continues contact a veterinary behaviorist.